I love when bars creatively mix and match their spirits to come up with unique combinations you’d never expect. The Olivia had one of those descriptions I just had to try; Sauza hornitos tequila with the flowery St. Germain, sour mix, and cranberry juice. I couldn’t begin to guess how that would all taste together. The answer? Not great. The tequila was difficult to taste at all and the white cranberry juice too mellow to contribute much to the drink’s layers. 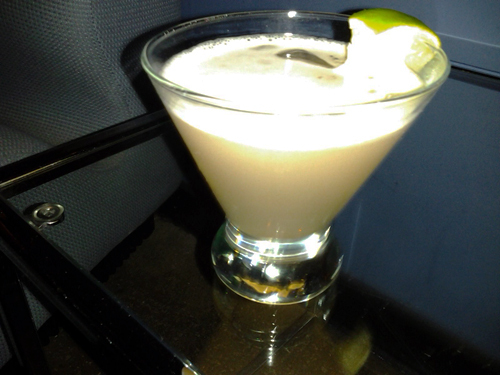 The dominating element was definitely the sour mix, and that is not a good thing for any drink. I personally think sour mixes 1). should always, always be made in-house, and I think this was bottled, and 2. should be used in small quantities and only to contrast with other bold flavors. None of the other ingredients were strong enough to stand up to it, though I did like the brief respites of elderflower once the sour mix washed away from each sip. To sum up: Sometimes, experimentation goes awry.